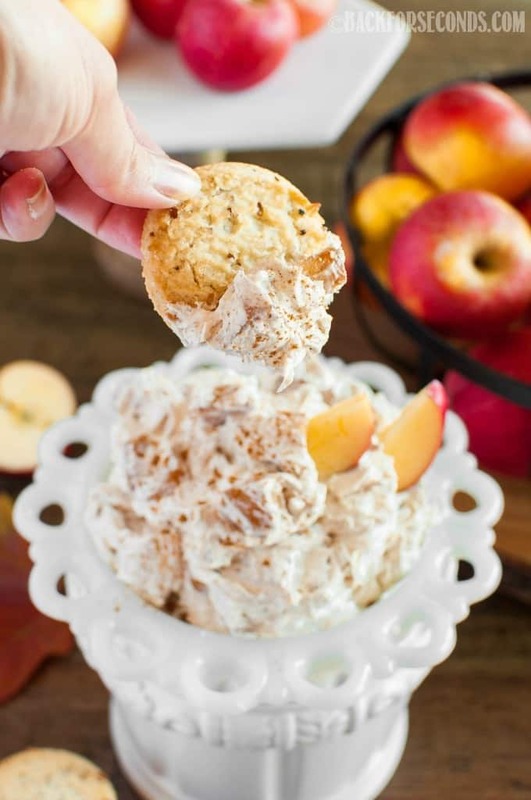 No bake Apple Pie Cheesecake Fluff has all the flavors of apple pie and cheesecake, in one easy dip! A great side dish or dessert for holidays and parties! I think apple pie is the quintessential fall dessert (right along with pumpkin pie), but not everyone is up for baking pastries. 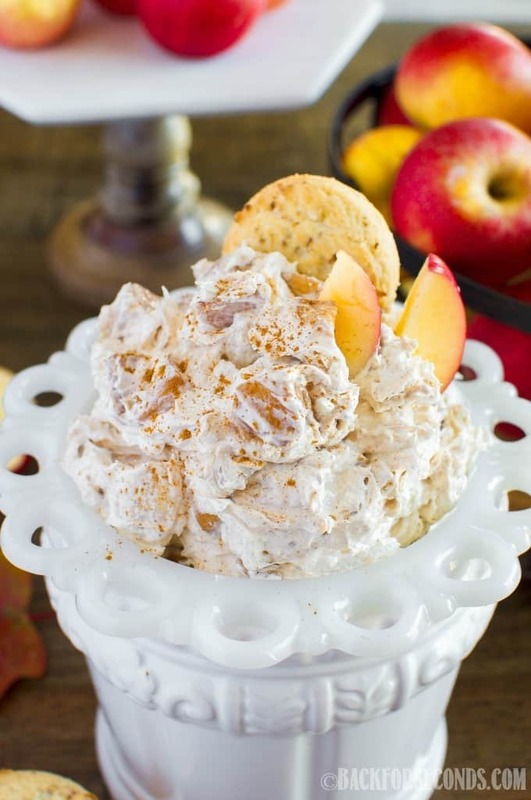 This light and creamy cheesecake fluff is full of cinnamon, spice, and all the goodness of apple pie! Last year I came up with the idea to turn pumpkin pie into a no bake Pumpkin Pie Oreo Cheesecake Fluff, and it was awesome!! After picking apples at the local apple orchard twice in one week, I knew lots of apple recipes would be happening soon! Some of our favorites are this Cinnamon Apple Bread, and these Snickerdoodle Apple Pie Bars. SO GOOD! Once I came up with the idea for this dip, I couldn’t wait to get in the kitchen! My 3 year old son helped me make it, and my one year old was my first taste tester. 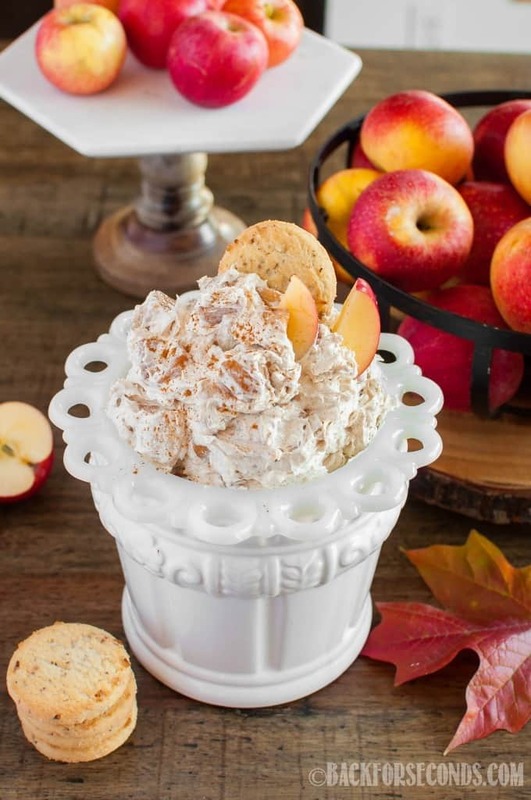 He gave me a big smile and a full blown happy dance – I’d say this Apple Pie Cheesecake Fluff is a hit! It’s so good with pecan candies, apple slices, or cinnamon graham crackers…or a spoon! Enjoy! Yum!! This looks delicious! Thanks for sharing! I love your apple cream cheese fluff so much mom.l can’t wait to have some more .